Pinch Social | SMWi Toronto Swag Bags sponsored by BRAND BLVD – What’s in it? Hopefully by now you’ve learned about the great speakers and spaces we have lined up for Social Media Week in Toronto 2016. We’re excited to announce that we’ll also be giving away swag bags to our All Access Pass holders! We’ve been working with our sponsor BRAND BLVD to create branded SMWi Toronto gear sure to help you enjoy and commemorate the event! The bag itself is an easy-to-carry blue and black tote bag made from recycled materials. This convenient SMWi Toronto bag will be easy to carry around the event and provide space to carry other belongings as well! As you’re sure to hear some great bits of information from our speakers, we’ve included a handy SMWi Toronto notebook! It comes with a pen and features our logo – a great souvenir of the event. These sharp blue and black SMWi/BRANDBLVD branded sunglasses also come in the bag! Who doesn’t love free sunglasses? These earbuds come in a small protective case making them easy to take on-the-go. The Twitter bird we all know and love comes to life. This squeezable twitter bird is handy to have around when things get hectic in the work week and you need to let out some stress! 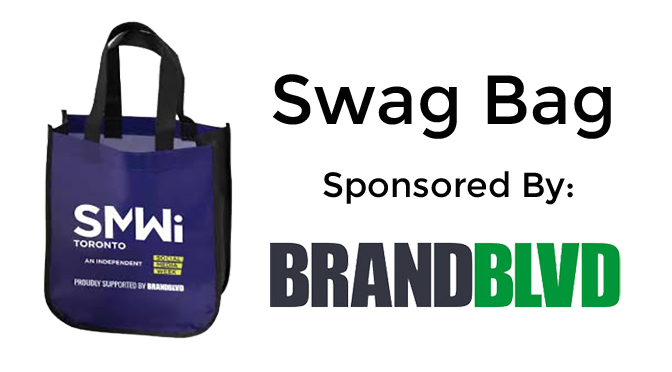 We worked closely with our sponsor BRAND BLVD to make the swag bag possible. BRAND BLVD is based in St. Catherine’s ON, just a short distance outside of the city. They’re a leading edge promotional firm that takes a proactive and fresh approach at providing quality promotional products and corporate apparel. They focus on creating great products as a means to create awareness and ultimately build your brand. If you want to learn more about BRAND BLVD, check out their website to see some of the products they have, team information, contact details, and more. If you’re interested in a swag bag and looking to get an All Access Pass, click here!